This image shows the location of an area known as Sotra Facula on Saturn's moon Titan. The black and white swaths show data obtained by the radar instrument on NASA's Cassini spacecraft. The swaths were laid on top of a global composite image from Cassini's visual and infrared mapping spectrometer. Scientists believe the Sotra Facula region makes the best case for a cryovolcanic – or ice volcano – region on Titan. SAN FRANCISCO -- For the first time, scientists now have solid evidence for an ice volcano on Saturn's moon Titan, according to a new study. Instead of regular lava, the volcano may spew water ice, hydrocarbons or a variety of other materials into Titan's thick atmosphere, scientists said. Such an ice volcano's existence could help solve some mysteries about Titan's carbon cycle, researchers said, and it could increase the likelihood that life exists on the huge moon. "We finally have some proof that Titan is an active world," study co-author Randy Kirk, a geophysicist with the U.S. Geological Survey in Flagstaff, Ariz., told reporters today (Dec. 14) here at the fall meeting of the American Geophysical Union. Many scientists think ice volcanoes, also known as cryovolcanoes, may be relatively common on the frigid moons of the outer solar system. They've confirmed at least one, which spews jets of icy vapor from the south polar region of another of Saturn's moons, Enceladus. Previous research had offered hints that Titan, Saturn's largest moon, might harbor a cryovolcano, too. The new work offers solid evidence of one for the first time, researchers said. Kirk and his colleagues used observations made by NASA's Cassini spacecraft in orbit around Saturn. 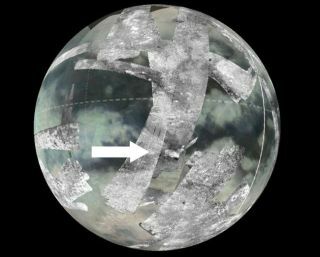 Using radar and its Visual and Infrared Mapping Spectrometer instrument, Cassini took detailed images of the region around a Titan landform known as Sotra Facula. These pictures revealed three large conical features with material flowing outward from them, as well as several deep pits. The peaks are about 3,280 to 4,921 feet (1,000 to 1,500 meters) tall, and one of the pits is about 4,921 feet (1,500 m) deep, researchers said. Taken together, these landforms point toward a cryovolcano, researchers said. "It's really this combination of features that makes us think we've found good evidence of a volcano on Titan," Kirk said. Theoretically, the deep pits could be impact craters. But this isn't likely, according to an outside expert. "Titan is an extremely sparsely cratered world," said Jeffrey Kargel of the University of Arizona, who was not involved in the new study. "Cryovolcanism is by far the best explanation, in my view." Replenishing methane, and possibly spurring life? A cryovolcano could help explain a long-standing Titan mystery. The planet's thick, nitrogen-rich atmosphere has substantial amounts of methane swirling about in it. But this methane should be broken down by sunlight, researchers said, on the timescale of about 10 million years. So something is likely replenishing Titan's methane stores. And an ice volcano is a good candidate, according to researchers. "The cryovolcano offers a perfect opportunity to get that methane gas from the interior of Titan into the atmosphere," said Linda Spilker, a Cassini project scientist at NASA's Jet Propulsion Laboratory in Pasadena, Calif.
That being said, the team isn't sure exactly what the cryovolcano might be spewing into Titan's air. It might be mostly water, or water and ammonium, or lots of hydrocarbons, researchers said. And a Titan cryovolcano is intriguing for another reason. Scientists have long speculated that Titan might be a good place to search for life beyond Earth. It has a thick atmosphere, complex chemistry and liquid-hydrocarbon lakes on its surface. While the searing-hot volcanoes on Earth are destroyers of life, volcanoes on frigid worlds such as Titan and Enceladus might be good places for life to take root, researchers said. Cryovolcanoes could provide a way to mix complex chemicals on the giant moon's surface with its interior, which may harbor a subsurface, liquid-water sea. A cryovolcano might someday help scientists determine if life exists, or ever has existed, on Titan, researchers added. It could bring any subsurface life forms, if they exist, up to the surface, where scientists and their instruments have a better chance of detecting them, though such a mission is probably far off in the future. "This offers us one way to get at that interior," Kirk said.